Free admission: Children up to 6 years; children from children’s homes or SOS children’s villages; holders of physical disability cards (ZTP, ZTP/P and people accompanying them); ICOM, the National Museum Society; holders of the Benefit card of the European GNSS Agency – the Ministry of Transport, Prague Card. 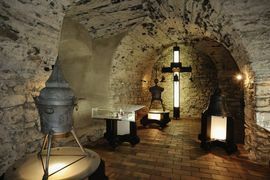 The tour is possible only with a guide, except for the exposition of the Czech bell tower. The Chateau in Vrchotovy Janovice, together with the original park, is a special place with an unobtrusive, yet powerful and unique charm. Originally a Gothic stone citadel of the Lords of Janovice, protected by a moat, it was later rebuilt in Renaissance style by the Lords of Říčany and changed in the 18th Century to the representative seat of the Votice branch of the Counts of Vrtba. Later, the Vratislavs of Mitrovice arrived and with them the last overall reconstruction of the whole area in the mid-19th Century. It was then that the castle gained its present Neo-Gothic appearance. During the time of the last private owners, Nádherní of Borutín, mainly in the first half of the 20th Century, the castle, in the middle of the old landscaped park, was the venue for the meetings of Baroness Sidonie Nádherná with her interesting guests. During the 2nd World War the Chateau was utilised as a military headquarters and barracks. Vrchotovy Janovice, as part of a military area, was evacuated and gradually an “educational camp” for refugees from forced labour in Germany was established there, a “concentration camp” for people whose ancestors or relatives were Jews and a “concentration camp for political prisoners”, a branch of the Flossenburg camp. Both the Soviet and Czechoslovakian armies resided in the Chateau in the period just after the War. In 1950, the Chateau was expropriated and used as a textile warehouse and later for collections of the Regional Archive – and it gradually became derelict. The National Museum saved it from destruction at the end of the 50s. Now the Vrchotovy Janovice Chateau – together with its park – has been part of the Museum for almost 50 years. 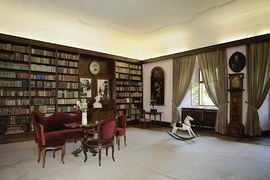 A visit to the Chateau offers – amongst other things – also the long-term exhibitions of the National Museum: “Society in Bohemia of the 19th Century”, “Rilke, Kraus and Vrchotovy Janovice” and “Czech Bellfounding”.